We already knew that the Nokia 8 will be launched in the UK on September 13 and now you have the chance to book your unit. Carphone Warehouse has started accepting pre-orders for the phone at £500. 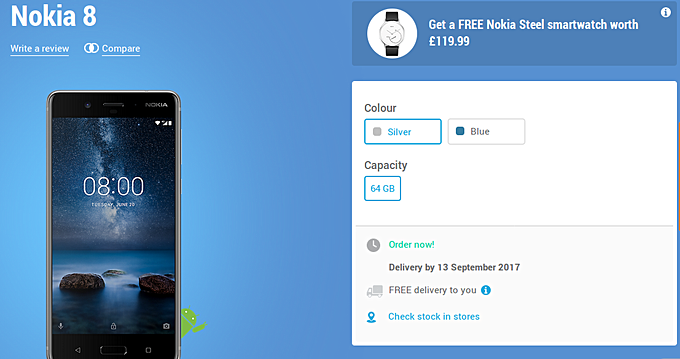 The retailer is offering the silver and blue color options, and those pre-ordering will also get a free Nokia Steel smartwatch worth £120. The wearable is capable of tracking steps, distance, and calories. It's also waterproof up to 50m. For more information, head to the Source link below.